Go back to Eren, save your game and then go to [13,3]. Cut the trees in the left part of screen and a secret stair will appear. Pay the girl 10 horns to let you pass and then you'll be at coastal shore. 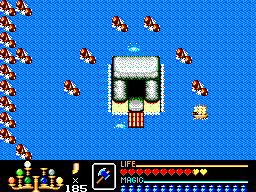 Now that you have the Ship from the 7th labyrinth, you can go to the 8th labyrinth which is in the middle of the sea. With your ship, go down then left, or left then down, whichever way you like. 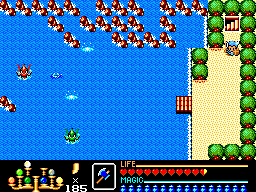 Ignore the enemies in the sea and do your best to reach the labyrinth with all life points. There are no nearer save points other than in Eren, so do your best not to die. You'll be glad to know this is one of the smallest labyrinths, in contrast to the sixth. 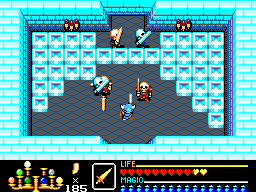 The first part of the labyrinth is rather easy, kill the skeletons and a passage will open. 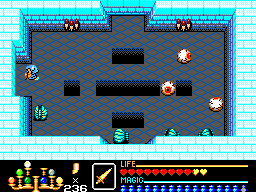 In the next room, stay away from the blocks, 3 of them are monsters, so deal first with the red demons, then bring them out of their camouflage and kill them. The shut door will open when all monsters are defeated. You've already seen the second boss, now it's the first who's after you. This time, the doorway trick will only work if you use Thunder Magic. The same way, you'll get a piece of meat when you beat him. In the next room, ignore the flames and go straight to the warp. 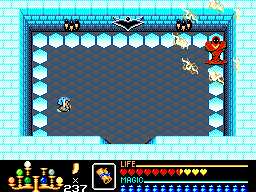 You'll wind up in room with some bats, kill them to open the right door and push the left torch on the wall. This will open a passage in the flames room where you were previously. 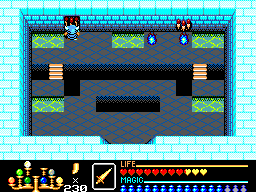 Then go right and push the left torch, note that you don't need to kill any monsters in that room. Go all the way back and when you're at the warp room again, go down twice, skipping the first room below it. Mind not those two chests, as usual, they're just monsters. 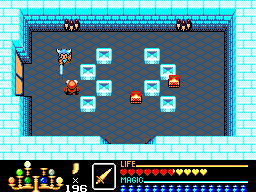 Destroy the brick to the right and a new warp will appear. Kill all monsters in the first room and the shut door will open. 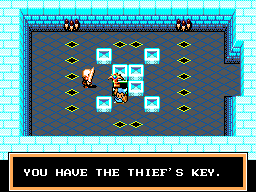 Enter it and get the Thief's Key. With it, your locked door trouble days are all over! Go back and enter the top door now. 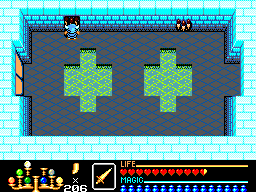 Push the right torch on the wall and the remaining shut door in the first part of the labyrinth will be open. Go back through the warp and from there go up and left. Enter the warp in that room. 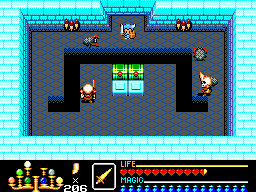 In the final room, kill all enemies and the shut door will open. 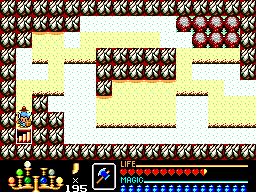 Make sure you have enough magic to cast Thunder Magic as it will be needed to beat this labyrinth's boss. 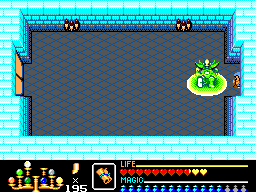 This boss labyrinth behaves in a similar way to the 4th Boss except those sparks around him turn into small red bullets. Using the Thunder Magic is the best way to deal with him. Just make sure you keep some distance between you and him. Get the cyan crystal and you're done. 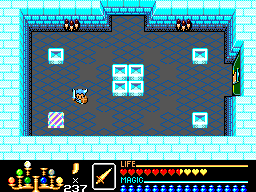 Lastly, enter the locked door in the previous room and from there you can be teleported to the beginning of the labyrinth. Only 2 more to go!